One of the more complicated aspects of developing Office templates is automation. Office includes a programming language called Visual Basic for Applications [VBA], a reduced version of Visual Basic, used to develop stand-alone applications for Windows. VBA is also built into Office for Mac, and in most cases automation can be cross-platform. At Operandi, we believe that any automation needs to be relevant to the project and what the client needs. We don’t force prebuilt automation or custom menus on people who don’t need it. We prefer to develop a more defined solution, giving them the extended features they need to do their job. Automation is generally anything that performs a number of tasks combined into one step, saving the user the time to perform each task one at a time. For instance, you might choose to collect all the relevant details for a report when you first create it, or allow the user to make choices for multiple covers or document sections or adding in a predesign divider page. VBA allows you to create a single button to do these things quickly. The examples in the video below illustrate some of the possibilities for templates. 3. Set up, import and processing of Excel data into a fully designed and formatted financial report. 1. The client wanted a single letterhead that could be used in any of its offices, but where the user could choose any of the locations. We developed an entry form that collected the set up details, like recipient address and the sender details, which included a memory system that stores the sender’s details for the next letter. 2. This template was for a team of people to create bid reports in a large law firm. It had to incorporate a server-based library system for images, logos, profile pages, client quotes, etc. We created a folder system that the toolbar accessed, listing the contents of each key folder, where the user could choose items to insert into their pages. In many cases, the imported content was formatted automatically. 3. We were commissioned to develop a Word template that could import and process Excel data into an annual report for each property in this companies portfolio. The data was exported from their accounts software into a folder for each property. Our template, which was preset with cover, table of contents and specific sections, imported this data, formatting it to style as it processed it. Each report dealt with at least three Excel sheets for income, facilities costs, shared costs by apartment, etc. The final report was then signed off and saved to PDF, where it was printed and included in a postage pack to each property on the estate. Over the years, we’ve developed projects that have needed a custom menu to hold both user-centric facilities and to manage a library facility. A menu can include drop down lists for the user to choose from and buttons to access additional functions not necessarily offered by the main application. The above example, for a law firm’s bid reports, gave the user access to a server-based folder system that included predefined documents that the user could insert into their reports. It also gave the team the ability to manage the photo and logo library, drop in additional client quotes and testimonials, and to keep a set of team profiles, all that can be inserted into any new bid report. As the new library folders were live, any additional assets appeared immediately for the users. Equally, removing any logo or image would be instantly removed for the user. We don’t automatically add custom programming to our projects, because not every solution requires it. In a lot of cases, Word, for instance, already has the functionality you probably need, if the user has sufficient training to allow them to utilise it. Our main concern is a properly designed and developed template, which includes all the necessary defaults and settings built in. If you do require custom facilities, we will work with you to define the list of functions and how they work. The most likely solution for any custom programming is on a new menu. Automation is dependent on the ability of the software you want to extend. PowerPoint, for instance, has less links and features that can be programmed than Word. A custom menu may not be able to have the same functionality across the Office suite, and this is partly due to the different features of the different software. 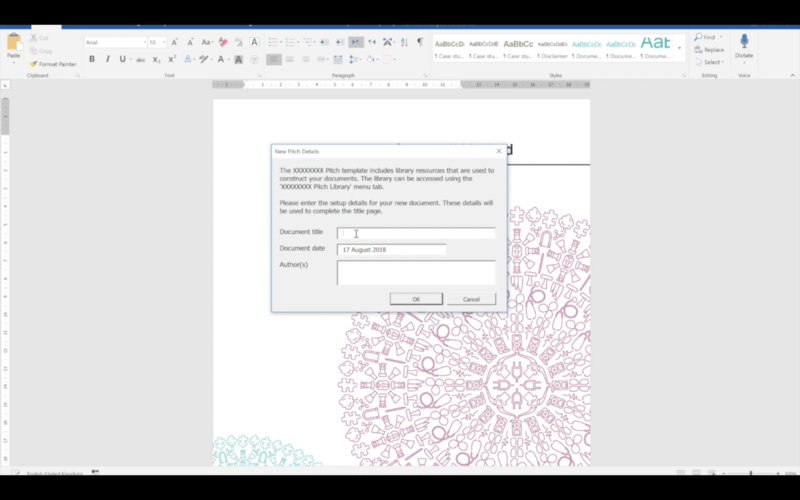 A menu can be attached to a specific template, or as a custom Add-in template that is available to any document in the main application. For more information on the work we do, or if you have a project you would like to discuss, call us on 020 3251 0251.